The variety of styles and trends in modern architecture is forcing home owners to resort to services of professional designers, whose knowledge in these areas is much wider than people of other professions have. For registration of home office such specialists offer a variety of options, but one of the most versatile and popular is a modern style. Style has appeared on the European continent and has manifested itself in architecture and art. Direction is relatively young and a little more older than a century. At the same time he does not have a distinct unified national universality. Therefore, in different countries are used their specific variations based on modern and each of them has a name: Tiffany for the US, Liberty in Italy, modernismo in Spain and others. Dynamic equilibrium, which is reflected in the smooth shapes and lines, can be considered as the fundamental characteristic of the style. This design looks very harmonious and balanced in terms of aesthetics. And this quality is manifested both in major elements and in the details. Special impact on the formation of the style has the technological leap, which was observed those days. Therefore, all design solutions are made taking into account the need to use the products of progress. Lines in the form of waves in decorating can be considered as distinctive elements. They resemble stalks of plants mostly. Using of animal and vegetable ornament for finishing and materials is most preferred. Here you can often see images of birds, plants, animals. Some designers complement the interior in modern style with female images. Creation of the most harmonious interior requires minimal use of straight lines and sharp corners and sharp transitions. The vast space should be filled with air and light. Creating space is one of the major challenges for designers working with this style. You may need to increase the door and window openings, displacement or removal of partitions and other similar methods. decorative lighting and so on. The floral themed decorations can often be seen on furniture. It can be both hand-carved or painted wood and textile design. Another advantage of this style is the optimal combination of decorative and practical function. Things which have the constructive as their main purpose are decorated by the color and special materials. Accessories which have the function of decoration are intended to support the aesthetic component. The main thing is to choose the perfect combination and to balance of these functions in the same room. One of them can be used as background. Plant or animal ornament will look naturally on the wallpaper. Lilies or irises are most commonly used. In order your study room seems more spacious keeping one of the major trends of style, you can use the multi-level ceilings and floors. In addition it will add interior constructive and diversity. The specific purpose of such facilities requires the exclusion of colorful and bright colors. This is fully consistent with the peculiarities of the selected style. However, some restrictions do not prevent you to show imagination and create original and new interior. Soft lines, smoothly flowing one to another, provide the necessary room amenities. Functional furniture will bring the desired comfort. This is largely due to the abundance of textiles. Its painting often looks like a bizarre intertwining of plant branches. If the office is supposed to be divided into zones, so, following main trends of style, it is necessary to achieve a smooth transition from one zone to another. You should avoid sharp distinctions. You can apply different patterns on the floor for the separation, but not strongly marked color differences. In addition, you can use forged partitions which should be as transparent as possible. A plexus of graceful stems and leaves of plants can also act as a forging pattern. Such a design course will add a light and airy to the interior, saving the functional areas at the same time. 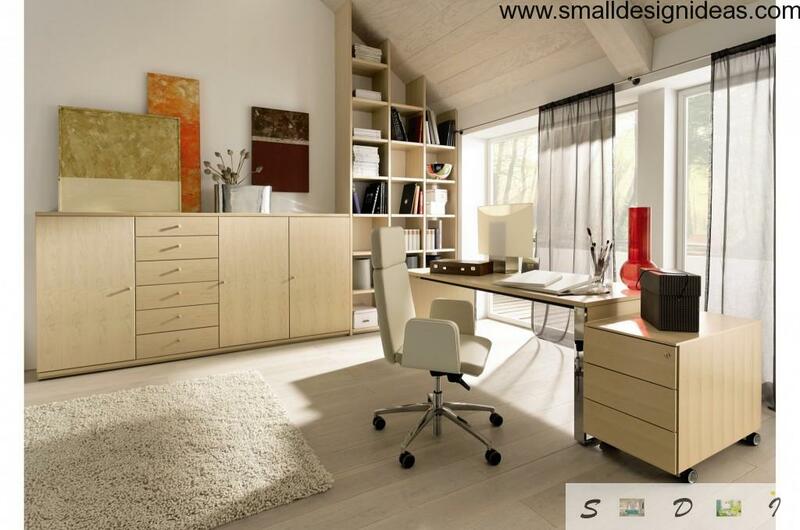 Maximum comfort and convenience of home office must be combined with the elegance and solidity of the furnishings. Partners and contractors often make their first impression of the office`s owner. This is especially important if you has to negotiate and enter into transactions in a home office. Selection of furniture in such style branch as Liberty can be original. Italian manufacturers are known for their meticulous attitude to details. This environment will provide the optimum combination of modern technology and fashion trends, while maintaining maximum practicality. This will be the base set. After installing it, you can take the selection of accessories, textiles and lighting. If your study room area allows, the furniture set may include far more units. Another type of Modern style is the trend of Art Nouveau. It is also suitable for home office, but will differ by refinement of lines and shapes. This trend in design art is able to give the interior a refined elegance combined with solidity. In such circumstances, it is possible not only to make deals, but also to spend time more pleasantly, having an abstract conversation with companions or family members. Art Nouveau is particularly perceptible for changes and actively absorb novelties from design world. It is considered the direction that will make the interior of any room fashionable and modern. Meanwhile, the general stylistics will be retained. Detracting from the decorative function of the furnishings, it is worth noting that the primary aim of the home office design is its functionality. If space of premises is limited, the furniture set should include the maximum number of practical subjects. It is even possible to use transforming furniture, roll out shelves and hidden storages. Such techniques help to avoid a large number of racks, mezzanines and all the stuff which can clutter the interior, weighing the overall atmosphere of the study room. Modern manufacturers include in their collections of furniture the models able to give the interior a maximum functionality, without damaging its stylistic picture. Classics became the basic style for the Modern. In modern interiors you can easily find manifestations of this ancient style. Therefore, one way to create a decent interior is the use of first-class expensive materials. Fine wood furniture increase the cost of these kits many times. In this case, the overall impression of the home office will be much more expressive, not to mention the quality indicators of such ambience. Expensive textiles often represented by natural fabrics. This may be linen or silk. Using such materials for furniture, you can be sure of a high quality of the furniture. If desired, you can replace the textile with leather. This kind of natural material is perfectly combined with the atmosphere and purpose of the study. Leather furniture differs by its external rigor and helps to set the business mood. The office lighting location is very important for the workflow. Thanks to proper light you can create a specific zones in the room which will be convenient for implementing different tasks. The main focus of the light must be disposed exactly in the work area. Most often it is a computer desk with all the necessary working appliances and accessories. 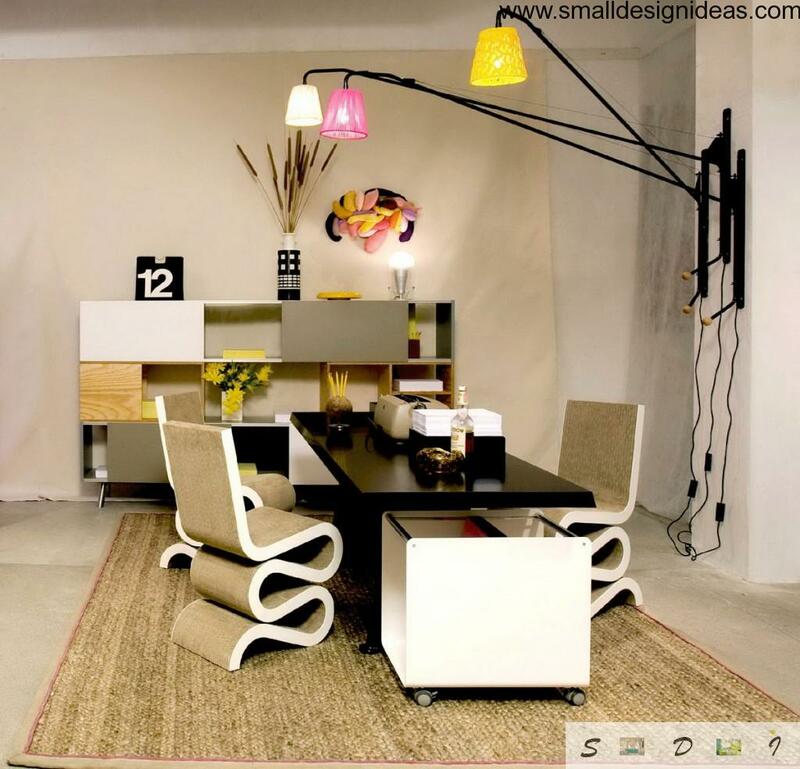 You can use more non-standard forms of the lampshades in a home office. Therefore, artsy lampshade over the table can be an excellent method. Table lamps should not also be excluded. Perhaps the owner of the office need additional light source while working with small font. Such a lamp may have a bizarre shape and resemble an animal or plant. Specificity of the home environment assumes a softer lighting than required by the office rooms. It is better to avoid fluorescent lamps filling the room with cool white light. Classic yellow light bulbs are the best option. Additionally, you can use the recessed spotlights. 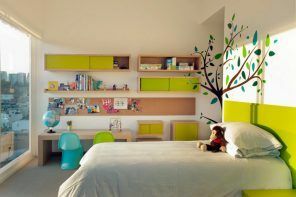 They can be placed in bookcases and shelves, as well as on the ceiling. 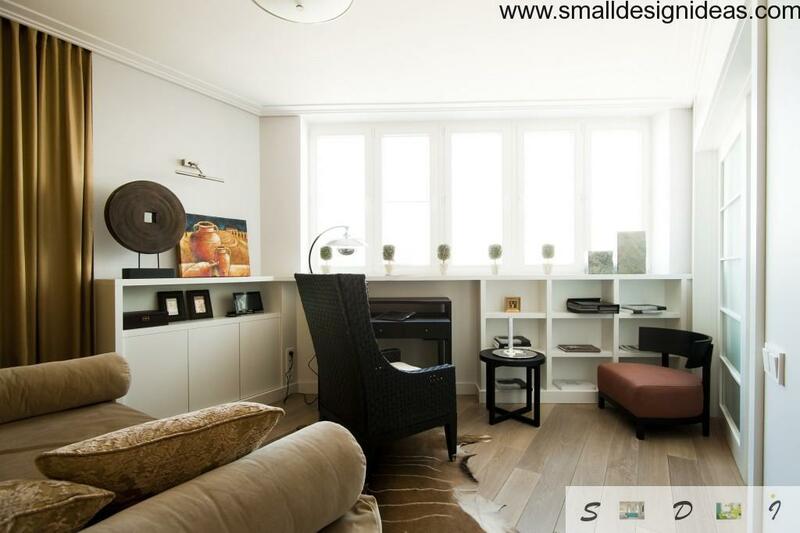 Area with upholstered furniture helps to decorate the wall sconces. Their light will be quite enough to relax after a long work. 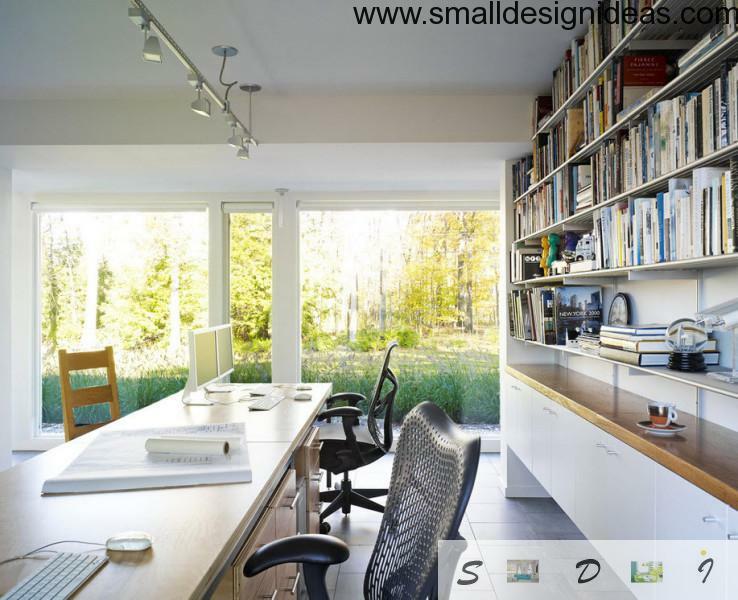 Focusing on the designer`s recommendations, you can create a beautiful home office which will be a pleasure to work or just to spend time with a book in.